Our womb is such an important part of our sacred body, and indeed where all of us humans come from. The alignment of our mind, heart and womb open the path to embrace our gifts and fulfill our visions. A great ‘tool’ to start, continue and support this life journey is the Jade Egg. Our gift as women who give birth, create a new life… And I don’t mean just babies, but birth ideas, creating anything you want in your life. …The moment you get up choose what to wear, you are using your creativity, even choosing your food; and when cooking it’s another trigger for your creativity!… My point is: creativity is not only connected with arts and artists. The Uterus is very Strong and Flexible – reflecting our women’s nature. It’s the strongest muscle in the body by weight with its multiple layers of muscle tissue that spiral together and runs in every direction. Just think about what it does to push a baby out! It’s ability to expand and contract is incredible. From the normal uterus size of a pear gets three times bigger when in it’s moontime (menstruating)! And then many more times bigger when a woman is pregnant: as large as a balloon, reaching all the way to the ribcage and visibly stretching the abdomen outwards. Womb Wisdom brings our Deepest Connection with the Self. How can you access this? One of the properties of the crystal Jade is as a kidney healer (thus the name emerged…); the kidneys are linked with the sexual organs. The Jade Egg works as a tool of profound healing for the sexual organs, opening the path to embrace the womb wisdom – healing our ancestral lineage and accessing the knowledge we carry from them. This is one of the reasons why the Jade Egg for me goes beyond the pelvic floor and when properly used works in all levels of our being. But indeed is a great healing tool with various physiological and physical benefits for our sexual organs, minimising and for some women totally finishing with various conditions associated with them. Womb and Jade Gate (sexual organs) healing open to deep self-awareness of the power you have within. When did I felt the Embodiment of the Womb Wisdom? A few years later when I was teaching a group of pregnant women for the first time (besides not wearing the jade egg in pregnancy this Holistic Practice is great to prepare for it, and to prepare for childbirth and post-birth), I started to share some exercises that I never had learned, read about nor experienced myself, as not being pregnant yet. Different from other sharings where I feel the channelling coming from above, this one I felt it come directly from my womb! 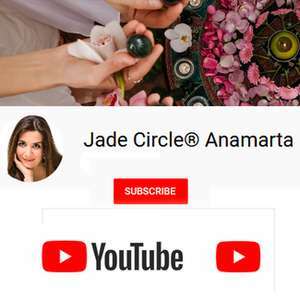 A few years ago, when my mum was present in the Jade Circle® for the first time, afterwards we talked, and I confirmed all the healing I felt. And then to my surprise, I got to know that my great-grandmother (from my mum’s side who died when I was five) I knew it she was a Medicine Woman and clairvoyant, but I didn’t know she was a midwife. So now I understand where it all came from! !… Also, I learned that she was the person to whom the other ladies from the village were going for sexual advice before marriage and during it – all in great secrecy of course! We are talking about one hundred years ago in Portugal! What is your relationship with our womb? How you related to it on a daily basis? When do you feel more connected with it? What does Womb Wisdom mean to you? Would you like to improve any of the above? When and how? Some Womb Love and Heart Connection. 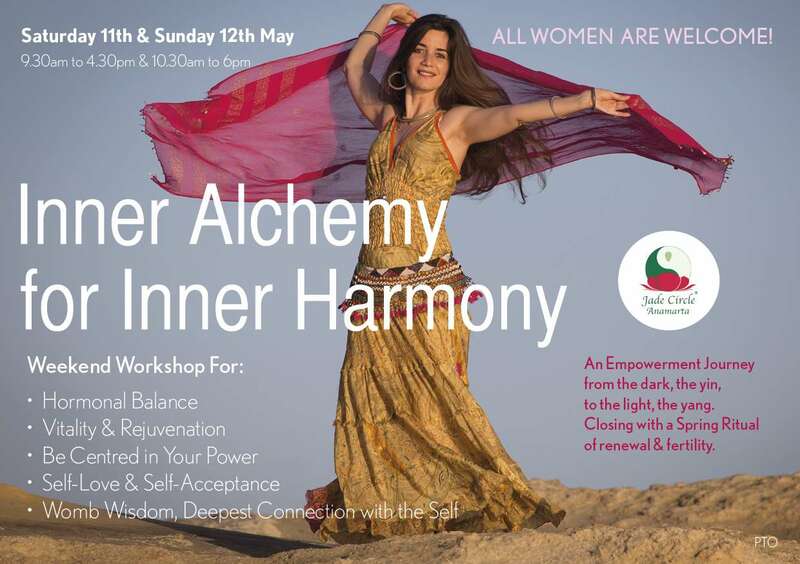 If you want a whole day, actually weekend of this join us on Saturday 11th May, a day dedicated to Womb Wisdom, Kidneys and Adrenal Glands Wellbeing and Rejuvenation, Vitality, the women psyche and more… to UNVEIL THE FEMININE MYSTERY! 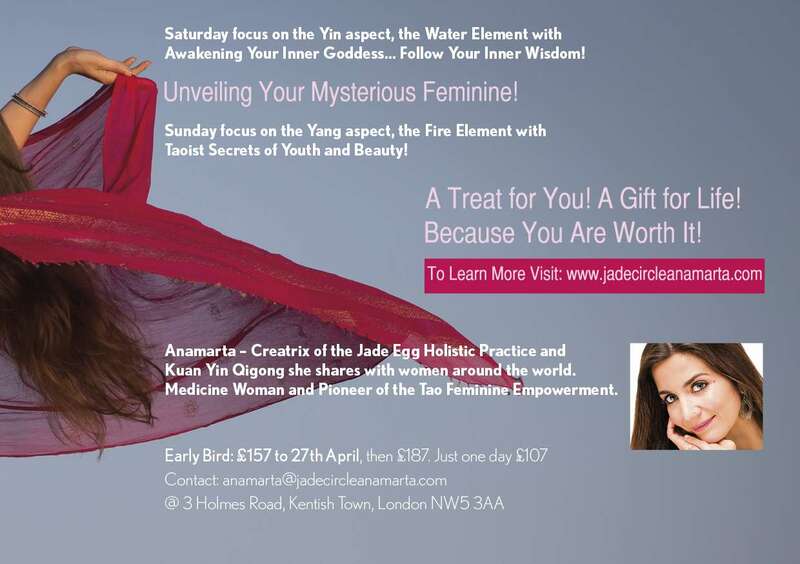 with Awakening Your Inner Goddess…Follow Your Inner Wisdom! Workshop. And gracefully the Sunday 12th follows with Taoist Secrets of Youth and Beauty! Workshop. A day dedicated to your Heart, Steady Hormonal Balance, Rejuvenation, Inner Beauty for Outer Radiance, Inner Fire Connection, and more! A TREAT FOR YOU! A GIFT FOR LIFE! BECAUSE YOU ARE WORTH IT! Closing this day with a Spring Ritual of Renewal & Fertility. Through Yin (women) Taoist Practices, Kuan Yin QiGong, Meditation, Visualisation, Shamanic Practices, Ritual and Dance – with a special treat of Hula Dance and Gypsy Dance! An Empowering Journey from the dark to the light: INNER ALCHEMY FOR INNER HARMONY – making the most of your yin (being) and yang (doing) energies.